DAVAO CITY, Philippines - The Bistro Group of Restaurants, one of the country’s major players in the casual dining industry, expands to Davao City as it opens two of its most popular concepts, T.G.I.Friday’s and Italianni’s, at the The Abreeza Mall. To be launched on May 12, the opening of these restaurants is expected to create quite a stir in the city’s newest leisure destination. Now, Dabawenos can enjoy that pleasurable dining experience that has been the trademark of Bistro restaurants through the years. Imagine those platters of great-tasting food in big portions meant for sharing that make your every peso worth spending, the welcoming ambiance and that trademark Bistro service that is friendly and efficient. Yes, ‘Eat’s’ always a celebration at Italianni’s, what with its generous servings of Italian-American cuisine, the old-world charm, welcoming atmosphere and great service. Dabawenos will love the restaurant’s most flavorful menu. Dishes come in portions meant for sharing (or Amore di’ Merrier) which means more can enjoy an order that give you more value for your money. Start your meal with a complimentary serving of freshly-baked Tuscan bread paired Italianni’s very own herb-infused olive oil and balsamic vinegar dip. Then, prepare to fall in love with its top sellers. The Sicilian Chicken Salad is, without a doubt, the number one choice in the salad selection. Crisp Romaine lettuce, sweet mango and red grapes are topped with flavorful chicken breast chunks, pine nuts for that extra crunch and drizzled with lemon-Dijon dressing. For entrée, the most popular is the Herb-Roasted Chicken, marinated in Italian herbs and perfectly roasted for meat is moist and delicious. Great food, fun and more fun! That’s what makes T.G.I.Friday’s one of the most recognizable icons in American casual dining. This promise can be enjoyed at their branch in Abreeza Mall. Dishes come in American-size portions that groups of people can enjoy and served by the energetic and cheerful waistaff. Some of the restaurant’s craveable dishes are Three-For-All, a medley of appetizers that includes the Friday’s original fried mozzarella and loaded potato skins and spicy buffalo wings and the all-time favorite,hand-battered Chicken Fingers that are friend to golden perfection and served with fries and choice of barbecue sauce or honey mustard dressing for dipping; and juicy and mouth-watering Burgers. One cannot also pass up on Jack Daniel’s Grill (fall-off-the-bone Ribs, Jack Daniel Salmon and Jack Daniel’s Chicken) flavored with Friday’s exclusive sweet and savory Jack Daniel’s sauce. A rich beverage tradition with smoothies, flings, mocktails, cocktails and their famous "Ultimate" drinks completes the menu. The whole dining experience is heightened by drink-tossing, bottle flipping bartenders manning the bar. TGIFriday’s at the Abreeza Mall is the restaurant’s 12th branch in the country and its 1st in Mindanao. 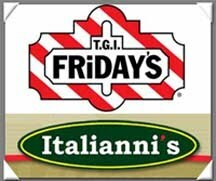 Italianni’s and TGI Friday’s are located at the Ground Floor, Abreeza Mall, Davao City. They are open Mondays to Sundays.